CPU-Z is one of my favorite applications on Windows. 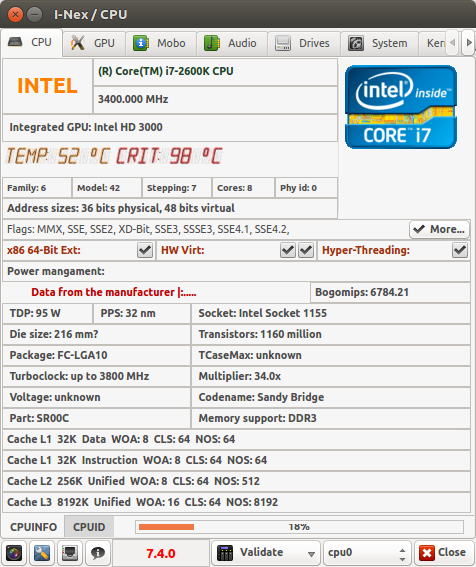 It beautifully displays detailed information about your CPU, RAM, motherboard and other parts of your system. i-Nex is a program designed to look and feel like a clone of CPU-Z on Linux. i-Nex is written using the Gambas language, a clone of Visual Basic for Linux. It requires 3.5 or a later version of Gambas, while Ubuntu has an older version. Note: CPU-G is another clone of CPU-Z for Linux. However, I find that i-Nex is far more detailed and closer in appearance and operation to the original CPU-Z.